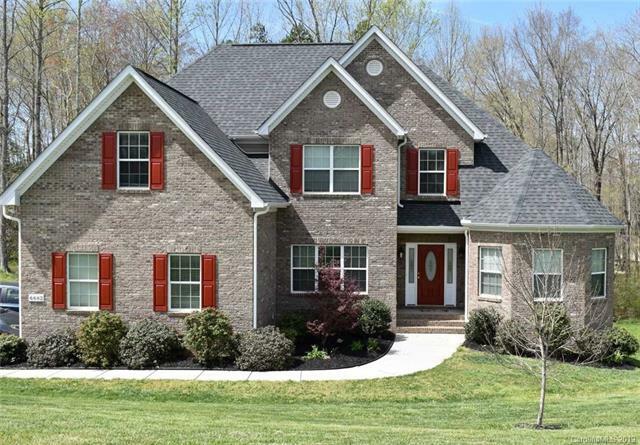 Appealing Lake Wylie home with in-law apartment in basement on a quiet street, only 5.5 years old on a large (1.5 ac) lot. 225-foot width and maturing Leland Cypress hedge rows on both sides plus wooded back yard provides additional privacy. Master BR on main floor with open floor plan. Walk-in pantry and large kitchen with ample storage space. Dark cherry colored hardwoods in all common areas on main floor. Large covered deck w/ ceiling fan in rear plus covered patio below at walkout basement level. Two bedrooms upstairs w/ walk-in closets, plus bonus room available as optional bedroom and 15x30 foot office. Plenty of attic storage! Basement offers separate living quarters for in-laws with kitchenette, full bath, laundry hookups, family area, and 1-2 bedrooms. Utility room has whole-house water filtration system and high-efficiency hybrid heat pump water heater. All rooms hard wired with ethernet for fastest Internet speeds. Workshop in garage. Close to Charlotte city limits!